Jazz up your Twitter profile in under 5 minutes. There are a lot of people on Twitter – 261 million Twitter accounts last time we checked. And that means it can be hard to make your account stand out. One way to be a bit different on Twitter is to change the font in your name and bio from the default. The good news is that changing the font on your Twitter bio is super-easy, and it's easy to play around with different fonts and change back to the default if you're not happy with what you've chosen. Below is the best way to get the font you want on Twitter. Note that this process is very similar to changing the font in your Instagram bio. In general, it's not a good idea to change your whole Twitter bio to a different font, as this could be hard to read and probably won't look good. We advise sticking to just one section or changing just your name. Also note that the fonts detailed below use unicode characters, which may mean they are not be accessible to people who use screen readers. So make sure you consider this/use these fonts sparingly. There are a number of different text generators you can use to find your perfect Twitter font. These range from the very ugly and non-user friendly to the quite nice and easy-to-use. We like LingoJam the best (pictured above), although some might enjoy the stark simplicity of Unicode Text Converter. You might also like to experiment with YayText, which shows you how your new font would look in an actual tweet (as opposed to just your bio). You'll have to copy and paste the text each time if you want to use a different font in all of your tweets though. But we're getting ahead of ourselves. Once you've decided on your font, you just need to copy it, and then paste it into your Twitter bio – go to Edit Profile to do this. Make sure that you're changing your Twitter name as opposed to your username (e.g. 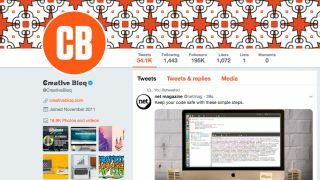 Creative Bloq as opposed to @CreativeBloq), as Twitter won't allow you to change the font of your username. Your Twitter profile will then update and you can decide whether this is the right font for you. If it's not, simply copy and paste another font across or return to the default by simply typing in your desired name. And you're ready to roll (or tweet)!